Basking shark: Second largest shark species, and it eats plankton! We headed out to the Southwest corner of Stellwagen Bank aboard the Cetacea this afternoon. While searching for whales we were surprised by a basking shark. The shark spent a lot of time at the surface and we followed its dorsal and caudal fins as it swam slowly alongside the boat. Passengers were excited to encounter such a close look at the second largest shark species in the animal kingdom! After a few looks, we continued our cetacean search. 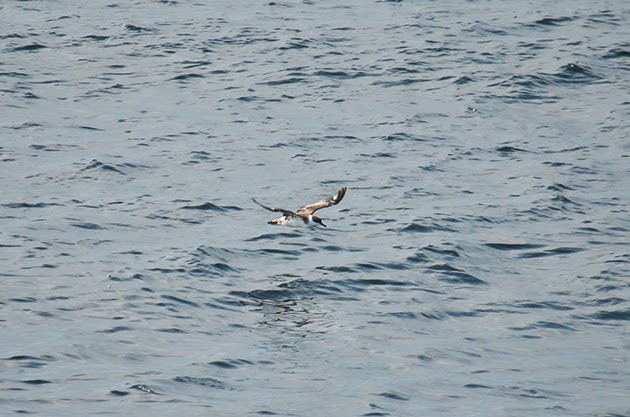 During the trip, we saw the Auk, a research vessel from NOAA. The Auk is a useful vessel to research teams surveying Stellwagen Bank. Perhaps they were doing a sand lance survey! 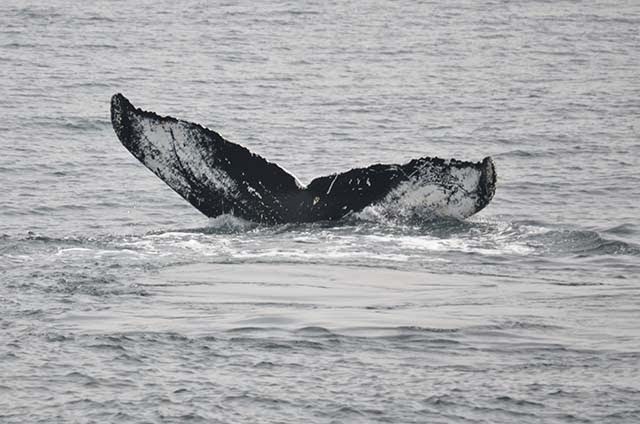 Eventually we found Hancock, a 23 year old female humpback, bubble feeding alone. 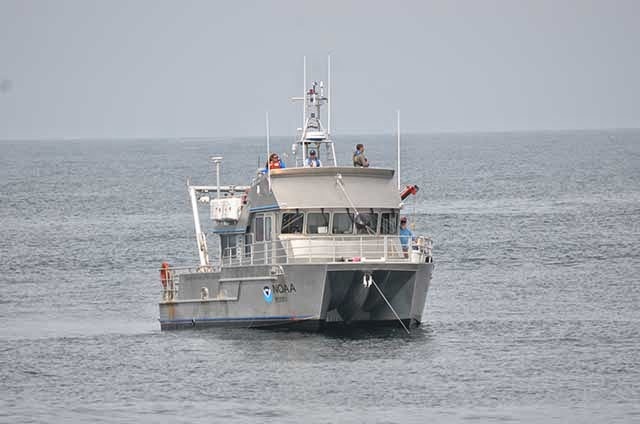 Throughout the trip Hancock took 2-minute dives and treated the passengers to consistent looks at her beautiful fluke. Hancock has an interesting marking on the right side of her fluke that looks like a signature, the whale’s “John Hancock” so to speak! On our way back to Boston, we happened upon three separate finback whales! Unfortunately, we didn’t have enough time to see more than one surfacing each. The ride back was smooth sailing as well, in contrast to the rocky ride out! 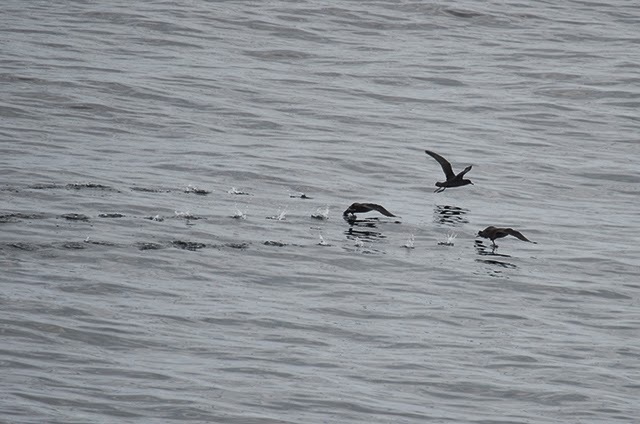 This afternoon on board the Asteria we headed out to the southwest corner of Stellwagen Bank. 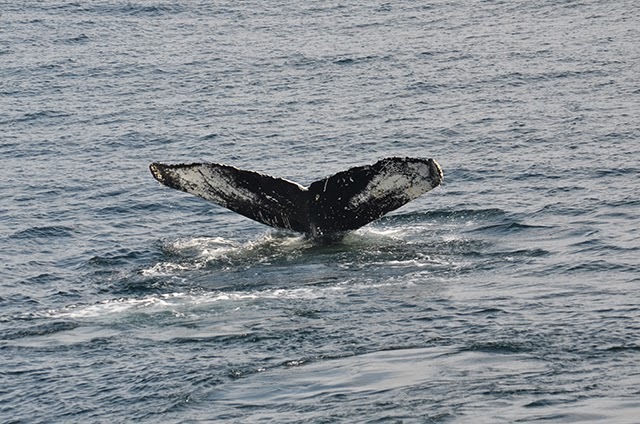 The seas had quieted a lot from the morning and we had fantastic conditions for viewing whales today. Great whale and shearwater watching conditions! We picked up a humpback named Hancock who was traveling, taking 3 minute dives and working in a circle so likely searching for fish at the seabed. We were treated to a bubble ring forming very close to the boat which was much more subtle than many of the bubble clouds and rings we’ve seen lately. Rather than huge bursts of green bubbles rising to the surface we noticed a little line of ripples at the surface which materialized into fine bubbles forming the green ring. We got some great open mouthed feeding looks after this. We moved off Hancock to try to find another whale in the area that other boats had been watching. We traveled all the way to the western edge a little farther north and saw some great bait activity, patterns of the bait fish being driven to the surface by predators (probably large fish), some seals, and some shearwaters but were unable to find this second whale. Overall it was a great day on the water. On our 12:00pm trip, we headed to the southeast corner of Stellwagen bank. First off, we spotted a minke whale, followed by two fin whales, followed by another minke whale. 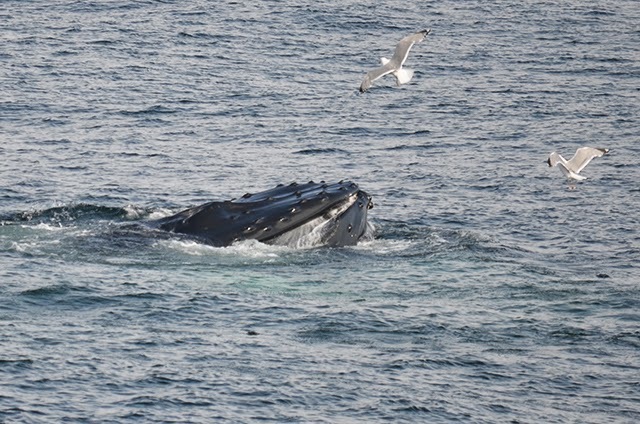 Then, luckily, we spotted a humpback taking dives. This humpback turned out to be Measles. Measles was moving pretty quickly through the area, taking 3 to 5 minute dives. While we were with Measles, we spotted the tall, column blow of another fin whale and also the fluke of another humpback. We headed towards this other humpback to see if it was a bit more active than Measles. This turned out to be Hancock. Hancock was making bubble nets and surface feeding repeatedly. She was taking a long time to make her bubble rings, spending quite a long time under the water after the first bubbles appeared and making numerous circles. Some of her bubble nets placed her quite close to the boat, giving passengers a good appreciation of how large this whale really is. As we left the bank, we also passed a fin whale who travelled with us for a while. This fin whale stuck its face out of the water every time it took a breath. On the 5:30 trip, we headed back to where we had left Hancock earlier in the day. We passed two fin whales on the way, getting some great looks at the coloration of one of their right sides (see photo). We continued on to find Hancock still bubble net feeding. She continuously made meticulous bubble rings and surface fed. A number of her surface feeds had her come extremely far out of the water. We also got to listen as she trumpeted a few times. Every time Hancock went to dive, she snaked slightly. Pushing her face out of the water while arching her back for the dive. It made for extremely graceful dives against the backdrop of a beautiful sunset.